Over 40 years of programming experience. Expand my "Full Biography" to see links to some articles I've written. Enums (shorthand for ‘enumerations’) are not often used by programmers but they can be quite valuable when they are. You would place that code in the Declarations section (in other words at the top) of any type of form or module. Each value in the list is defined internally by VB as a Long Integer and by default the first element will be given a value of 0, the second a value of 1, and so on. and you'd be right, but there are several advantages to Enums that will become apparent as you read on. Two that I’ll mention now however are: they are faster and take up less memory than strings and Intellisense will be available when you use them as shown in this picture. If you’ve forgotten how to invoke Intellisense, you press Ctrl+Spacebar, and in this case it was done after the equal sign was entered. You may not have realized it but you’ve probably run into Enums which are built into Visual Basic. 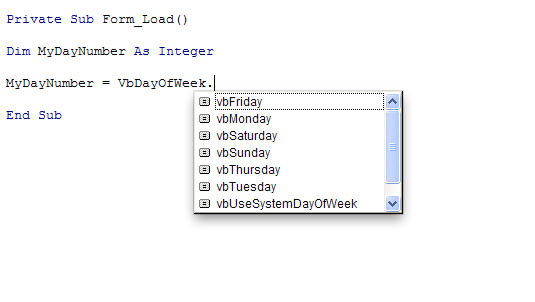 In that code if you chose vbFriday, MyDayNumber would be be given a value of 6. Another place you see Enums is in the property value choices that you see when for example you are setting the BorderStyle of a form. Which would give Subaru a value of 12. Like Consts however the values can only be changed in design mode and not by way of code. The following code contains two functions and two Subs that illustrate a couple of ways the Enum can be used. MsgBox "Ford is an american made car"
and then do something like this. Note that the special [_First] and [_Last] values won’t be shown by Intellisense and that the square brackets are needed to make them valid names. You should also note that you can assign any numeric value to a variable of Cars type even if that value is not in the Enum declaration, so intCar = 999 is valid but it would have no related Enum element. The [_Last] value is handy if you are going to often add new elements to the Enum since all you need do is change the value of [_Last] and the validation shown above would still work. One of the hallmarks of a well-written program is self-documentation or readability. Lets take an example of some code that in my opinion is not well written. Assume that the program has a control array called txtName (thank goodness it's not called Text43) and it consists of three members. In that program the author writes this code. where it's immediately apparent that a last name, first name, middle initial string is being created. When the author wrote that code he'd also find that naming the Enum entries with a common prefix like that allows him to invoke Intellisense after typing in ‘bn’ to see and select the appropriate Enum element name. I use Enums all the time and I think after you use one you'll find that you do too. Your future self and/or the people who maintain your code will appreciate that. If you find that this article has been helpful, please click the “thumb’s up” button below. Doing so lets me know what is valuable for EE members and provides direction for future articles. It also provides me with positive feedback in the form of a few points. Thanks!